Longtime Riverview High coach Bill Leiby talks with his Sharks players prior to one of his last practices as head coach. Leiby has stepped down after 20 years of coaching Hillsborough County to take a new position with BSN Sports. **ATTENTION** There will be a ceremony honoring Coach Leiby prior to the Sharks annual Black & Blue scrimmage game at Riverview on Feb. 15 at 6 p.m. All former players, students and friends are invited to attend. RIVERVIEW – One of Bill Leiby’s favorite parts of the day each spring afternoon has been the ritual of putting on a pair of baseball pants. That simple wardrobe change each day, that’s the thing Leiby said will pop into his brain first over the upcoming weeks. 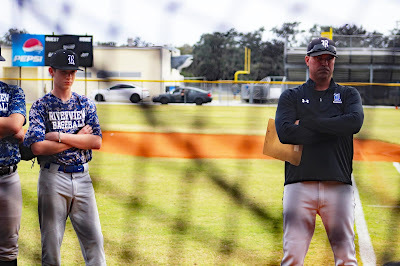 After 20 years of coaching – 15 as the head coach at Riverview High – Leiby has stepped down as a head baseball coach in Hillsborough County. 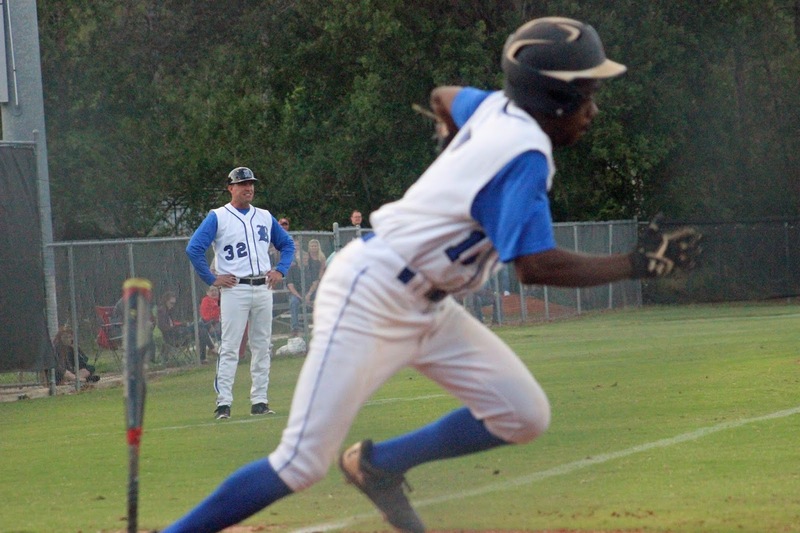 Leiby spent five seasons coaching and teaching at East Bay High, leading the program to its most recent region tournament appearance in 2001, before moving to Riverview in 2004. 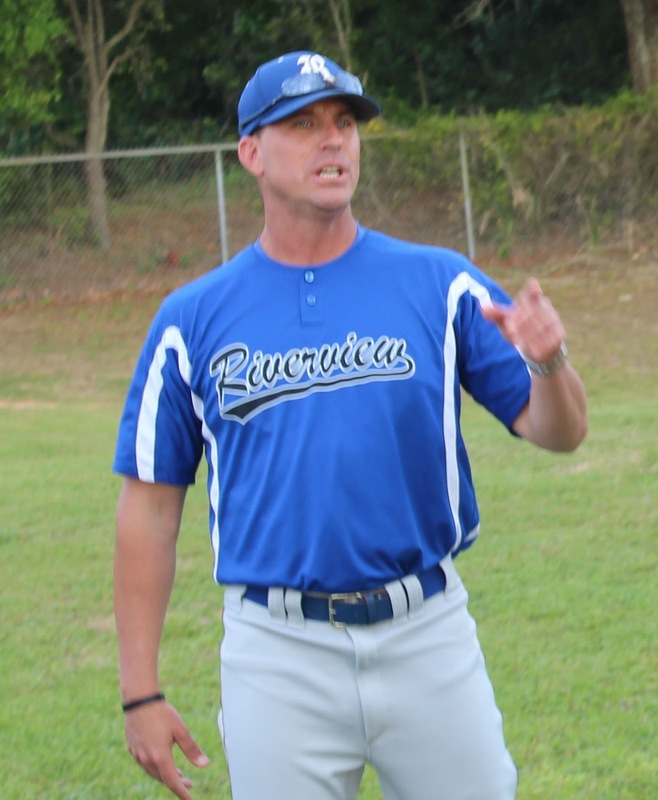 While serving as the Sharks’ skipper, Leiby helped Riverview to five region tournament appearances and two district titles. Leiby, 44, will move from coaching and teaching to a new role as an area sales representative for BSN Sports, a large national apparel and equipment company based out of Texas. The change will be difficult he said, because of his passion for coaching and connection with his players. But it was a move for him personally and professionally that he could not pass up. 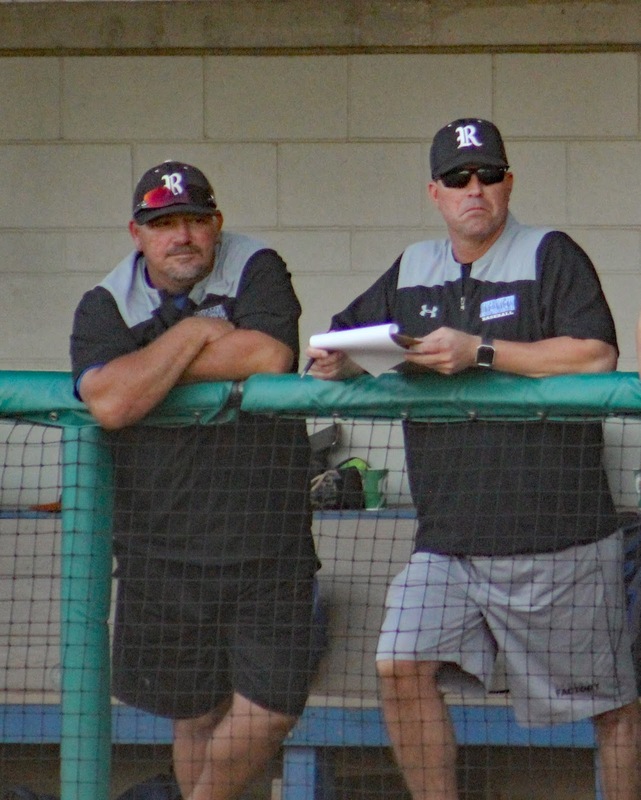 One of the things that made the decision a bit easier for Leiby, is the coaching leadership he is leaving behind including three of his longtime assistants who have each spent more than a decade alongside him guiding the program. According to Leiby, Mike Migliarese, a Riverview faculty member will assume the title of interim head coach, but along with Ryan Hoover and Ronnie Rodriguez, the trio of legacy coaches will each manage different aspects of the team’s development. For Rodriguez, the news of Leiby’s departure has been exceptionally tough. 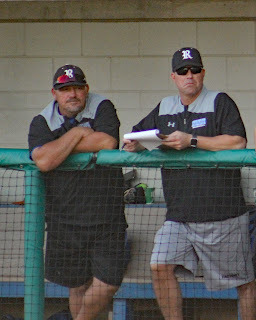 The longtime area high school and travel ball coach, has spent 20 years working with his partner and though he knows their friendship goes beyond coaching, it will definitely be a big change. 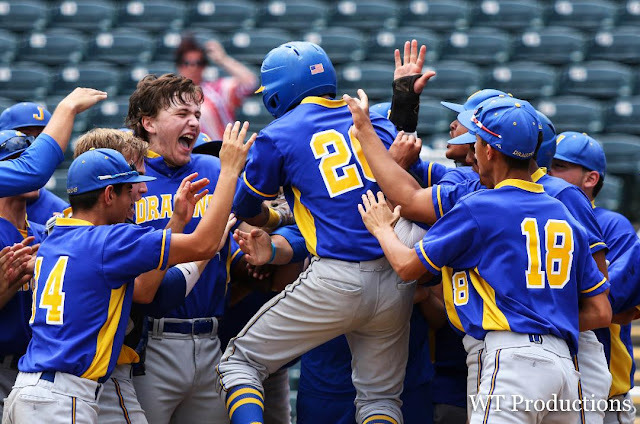 Rodriguez, a tremendous game preparer according to his now-former Riverview boss, said he is committed to carry on Leiby’s legacy for this season, but admits it will likely be his last in the high school game. “I love this,” he said. “But I don’t even want to try doing this with anybody else." Leiby from his post in the third base coaching box during a game in 2017. Asked to pinpoint some specific moment that sticks out most over his career, Leiby said he couldn’t pick just one. 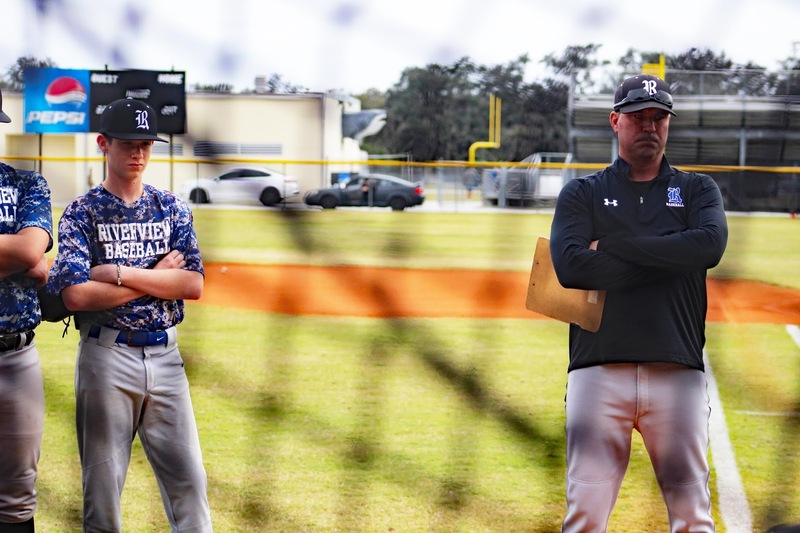 Some highlights for the two decades as a coach included having a winning record in his first season at East Bay, the district championships at Riverview in 2011 and 2017, coaching in the Under Armour All-American Game at Wrigley Field in Chicago, and the in-county rivalries against colleagues he considers friends. But ahead of all those things, Leiby said he takes specific pride in how his players excelled off the field, including finishing in the top 5 academically in the county over the last six years, as well as seeing his players get the opportunity to continue their playing careers and education at the next level. Now Leiby said there are new challenges outside of coaching ahead and he plans to go at them the same way he has faced challenges the past 20 years. Leiby (No. 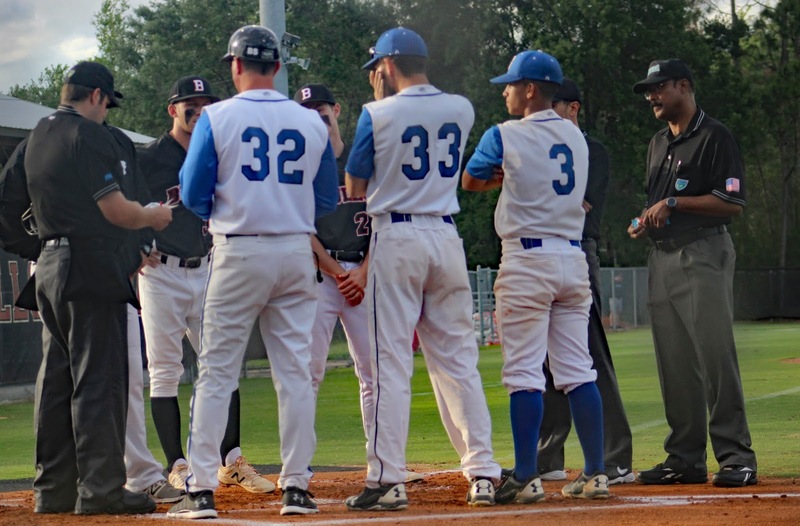 32) meets with the umpires and his opponents prior to the Sharks district championship win in 2017.